I'm not good at wearing trousers. I like what I like and I stick to it so my current trouser options are skinny jeans or culottes. But I know that my slimmest part is at my waist so in theory, a paper-bag style trouser should work? The website description for these trousers says that they're 'leg elongating'...I need ALL of that. Fit wise, they're generous, so I'm wearing the 10. The material is lovely - an autumn/winter weight of chino material that feels smooth - if that makes sense? It means they hang beautifully and don't crease. Now I'll hold my hands up here and say that despite the nipped in waist, they're not *the* most flattering trousers on me. Yes, they nip me in at my slimmest part but they do add fabric to my widest part - my hips. My blogging friend and photographer Marlene, agreed with me and so I got to thinking that a longer line jacket would better off-set this. 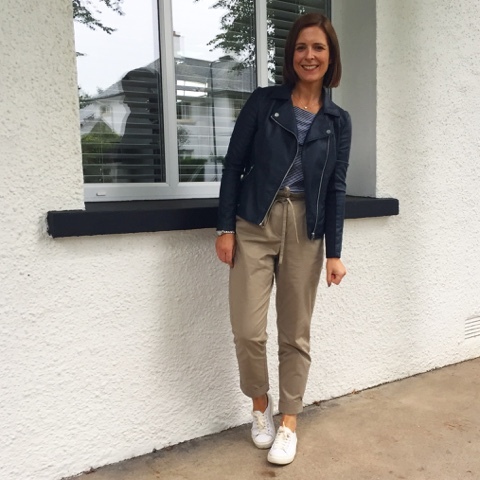 Zoom forward a week and I'm wearing them again with my new M&S Navy Biker. Much better I think. And as an aside, I need to talk more about this biker jacket because it's such a find. The most perfect shade of navy and it fits like a dream. I'm looking forward to wearing it lots this autumn/winter. So that's my foray into a different kind of trousers...maybe it'll make me braver? I'm actually looking forward to trying these with a killer heel on a night out...I think they could look pretty cool. And a huge thank you to my friend Marlene for taking the top two pictures. It was just wonderful to have an afternoon with her in London eating dim sum and frozen yogurt. 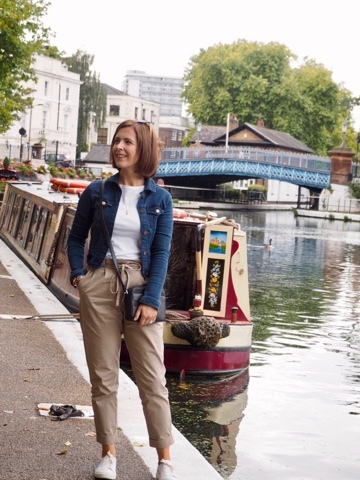 I even got to feature on her Instagram page - check it out on this link - 'mother with a drinking problem by a London canal'! I think they really suit you, sometimes it's just nice to wear something different for a change isn't it.